Today I leave town for the weekend for a girlfriends retreat with nine ladies. I spent a couple days this week making each one of them a scarf. It was a fun way to use up lots of fabric scraps in my stash. It all started with the scripture fabric which determined the width of the scarf and then I used varying sizes of coordinating materials. I decided to make them long enough to do the "through the loop" method. I hope they like them. Have a blessed Friday! too sweet! i hope i keep doing work that you enjoy! How pretty! Your friends are lucky ladies. Have a great retreat! Oh Man...I think that I just ruined a surprise for myself! I will act surprised at the appropriate time. The DELIGHT I feel will NOT be an act though!!! Beautiful! Wow! Wow! Wow! Love those scarves you made! 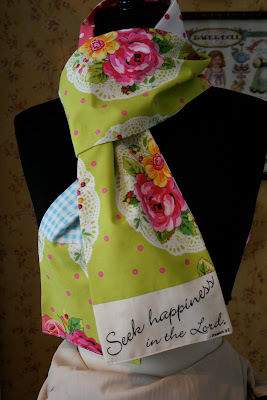 I have that scripture fabric, too, and have been trying to figure out a quick gift for someone, so thanks for the idea! SO CUTE! I pray you guys have a sweet week end. What a great beautiful gift for friends. They look beautiful! What a great idea. Those ladies are very lucky to have you as a friend! Have a great weekend. What's not to like about your scarves. They are a treasure and I am sure each lady will feel blessed to receive one. Where did you find the scripture fabric and what is the "Through the Loop" method? Have a great retreat and come home refreshed. Oh! And when you get the chance, can I have the source of the Chubby Chicks pattern? They are so cute. How special your friends must feel to receive something so precious! The scarves are gorgeous! What lovely scarves! Thank you for sharing your great idea. I have these same fabric panels. I hope to make some scarves for some of my loved ones.